Sidebar: calculate your body mass index or BMI here to see if you are overweight. At the medical office, we recently converted to a new electronic medical record keeping system. Updating the charts has required a considerable amount of my time. I haven't had the time to get the 10,000 steps I need to keep the weight off. Also, I have been binge eating. The other day, I exceeded my maximum tolerated BMI. I had a family conference with myself, and I decided to intervene. After spending countless hours researching the topic, studying the latest advances in weight loss (including medication and bariatric surgery), I decided that the best way for me personally to lose weight cost effectively and simply is calorie restriction, coupled with exercise when possible. That's how I did it before, and that's how I will do it again. This time, instead of paper, I will use universal applications, available on both Android and Apple (including iOS) to achieve the goal. 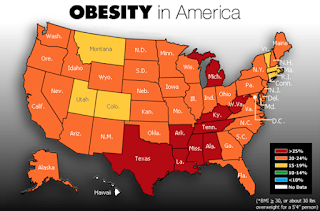 If you are overweight, and chances are you are given the figure below which shows the percentage of people with a BMI greater than 30 broken down by state, you might have an interest in how weight loss can be achieved using simple tracking tools available on the web. Obesity in Nebraska is rampant. 20 to 24 percent of the population has a BMI greater than 30. 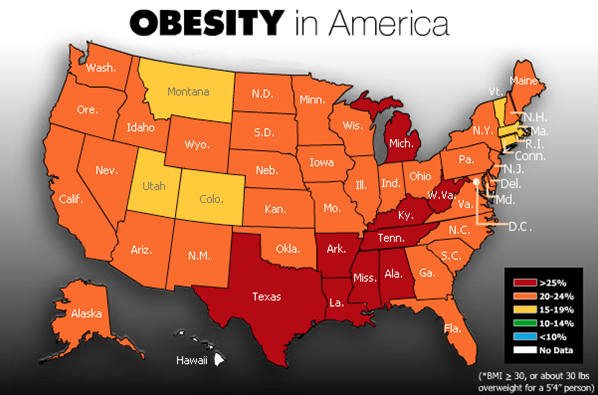 In other words, 1 in 5 to 1 in 4 people in the state are around 30 pounds overweight! The two tools I am using to facilitate my weight loss are called MyFast and Lose It! 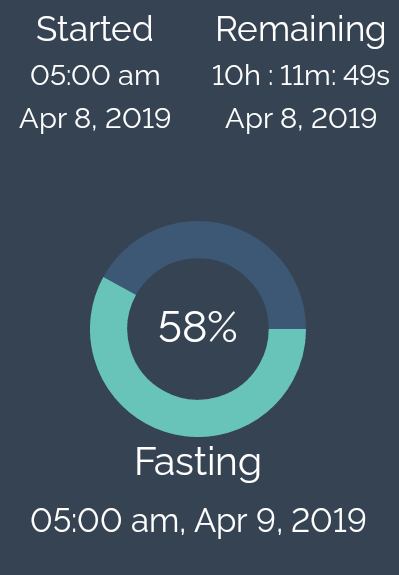 The purpose is to facilitate my tracking of a concept called intermittent fasting. What is intermittent fasting? Several books have been written on this topic. There are several variations to this. Simplified and suggested: Here is how basic intermittent fasting works using the 5:2 concept: For 5 days a week you eat what you want. For 2 days, you restrict your calories to a maximum ingested goal of 500-800 calories during that day. Water is unlimited. Ketogenic (enough-protein, high-in-fat, and low-in-carbohydrate foods) has been suggested by some. Others suggest Paleo. I prefer high protein, low-in-fat, and low-in-carbohydrate foods during the fast days. 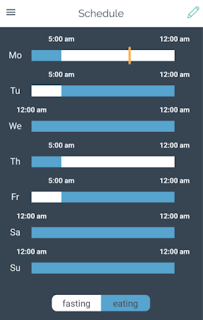 The two days I fast during the week are Mondays and Thursdays. These two days are most compatible with my schedule, but any two days of the week will work. Please note: If you have diabetes you need to be careful not to get hypoglycemic. Also, if you have trouble with fluid overload you need to look at your intake of water very closely. Let's avoid congestive heart failure if we can! Patients with chronic kidney disease and high blood pressure need to consider their salt intake. Please don't hurt yourself when attempting in good faith to lose weight. I could go on and on. Always consult your physician prior to undergoing any dietary program if you fall into a high risk medical category. That said, I suggest you talk with your doctor regarding your specific goals of care. Now let me show you, using pictures, how the apps work to achieve your intermittent fasting goal. Please note that these apps are configurable and can be upgraded to pro versions if you like them. If you don't like the workflow of these particular applications, consider alternatives readily available in the play stores. As shown: The intermittent "fast" starts at 5 AM on Monday and goes until 5 AM on Tuesday and Thursday. I also have set the program to remind me to fast every Monday and Thursday. Similar to alarms reminding you to take your medication, this program alarms to remind you that Monday and Thursday are "fast" days. I keep placing "fast" in quotes because you aren't really fasting -- both food and non-calorie beverages are allowed during the day. Recall that you are allowed up to 500 to 800 calories during the fast day. Next you need a way to track the consumed calories. I like the app Lose It! for this purpose. There are several features available to track your food intake quite easily. Also, Lose It! helps break down how many calories you should consume over the day. This App tracks calories both during fast days and non fast days by giving you a "budget" of calories you can consume throughout the day. The figure shows me adding 6 ounces of hamburger meat to the log. Notice that there are 43.8 grams of protein, 30.3 grams of total fat, and zero carbohydrates. Also note that this one hamburger equals the majority of food allowed for the fast day, or 460 calories out of a total of 500 to 800 allowed. 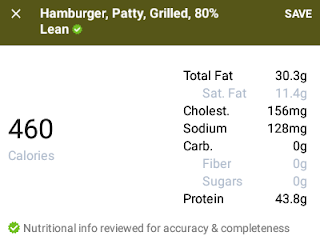 A 6 ounce hamburger with no bread equals 460 calories. That equals the majority of calories consumed during the fast day! The main logging screen counts the calories for you. What I like about the Lose It! 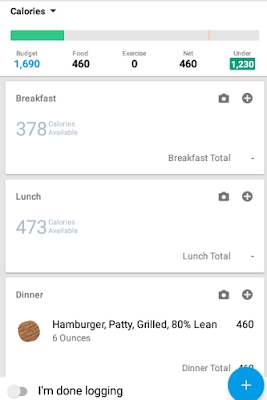 App: You can look at your calories on both fast and non fast days. You can also incorporate the effect of exercise both on fast and non fast days. In other words, if you walked those 10,000 steps you could figure that calculation into the total calorie equation. I call this approach the modified 5:2 diet because I'm tracking calories on non-fasting days, some of the time. 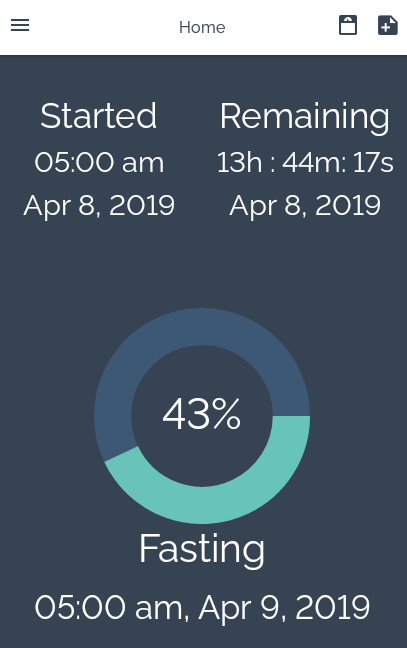 For example, if it were a Tuesday, and I wanted to modestly restrict my intake for quicker weight loss, I could easily track my calories for that day using this App. The phrase I use is: "I want to try and stay under my budgeted calories for the day." For me, I need to consume 1,690 calories or less to achieve target. Once I hit target, I can increase my daily calorie intake or decrease the number of fast days to once a week or every other week to maintain my goal target weight. What I didn't share until now is that the App asks you during setup how quickly you want to lose the weight. The budgeted calorie count, or allowable calories you may consume during the day, accounts for pounds lost per unit of time. In conclusion, there are several ways to lose weight. The method I present is just one of them. Try it. You may find success! It works for me. By the way, I'm 58% through today's fast. Only 10 hours to go. I'm almost done! Dr. Aaronson is 58% done with today's intermittent fast.